Arief (centre) fields questions from journalists. SINGAPORE: Indonesia is willing to assist Sarawak in addressing its labour shortage in the oil palm industry through a government-to-government arrangement, says Arief Yuwono Indonesia’s Deputy Minister of Environmental Degradation Control and Climate Change. To address the issue, he said there must be collaboration between the two countries to address the shortage of labour in Sarawak especially in the oil palm industry where harvesters were urgently needed to prevent them from losing about RM1 billion yearly through uncollected oil palm fresh fruit bunches (FFBs). “Yes, both countries can collaborate on that issue. 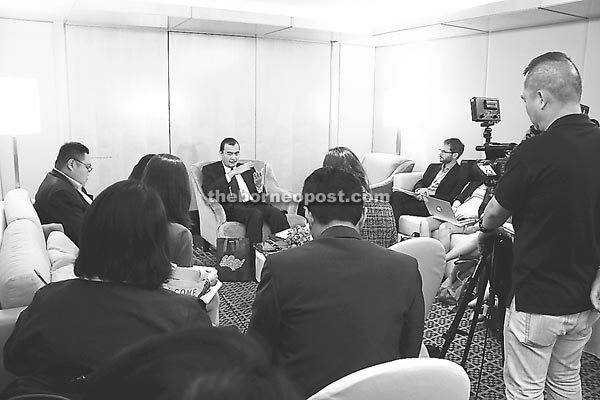 I believe it can be arranged,” Arief told The Borneo Post on the sidelines of the 2nd Singapore Dialogue on Sustainable World Resources – ‘Sustainability: A new Profit Driver?’ at a leading hotel here yesterday. He said if this G-G arrangement with Indonesia, currently the leading global exporter of palm oil, materialised, then Sarawak would be able to address its problem of recruiting local harvesters who had shun away from the job. Sarawak has agreed in principle to take in some 12,000 Bangladeshi workers to do the job starting in April this year, but the state government has been facing fierce criticism from local NGOs representing various ethnic groups, who claimed that Bangladeshi workers were not cut for the job. Sarawak urgently needs about 30,000 harvesters for the oil palm industry. At a press conference earlier, Arief said his country was seeking the cooperation of other Asean member countries to host the Asean Coordinating Centre on haze management meeting on September 7. He said President Joko Widodo who took office last year was serious in combating the almost ‘normal’ yearly haze issue in his country. Arief also disclosed that his government had imposed greater control on enforcement to reduce the haze. “On top of that we are going to improve our laws in the protection of the environment. Also, we are seeking cooperation from all stakeholders especially smallholders and local governments to work with us,” he said. He said since October last year the Indonesian government had issued many drastic measures to prevent haze by emphasising greater enforcement efforts at all levels. Arief added that Indonesia’s palm oil plantation had grown rapidly which resulted in the rising demand for land. “In 2009, area planted by oil palm was 4.888 million ha and now it has increased to 6.7 million ha,” he said, adding that Indonesia currently exported 17 million tonnes of crude palm oil (CPO) from the total global input of 58.3 million tonnes. “The rising need of land for oil palm plantation will surely impact the environment. In spatial planning regulation, 30 per cent of land ecosystem will be conserved. Peat land degradation and the use of fire for land clearing area has become another pressure for the environment. Meanwhile, Arief said his government was also serious in looking into the issue of global climate change and the cutting down of greenhouse gas emission in his government’s action plan of 2020. The one-day seminar was organised by the Singapore Institute of International Affairs (SIIA) which was attended by more than 100 participants representing various stakeholders.